The market for Florida property is already hot, but a recent report reveals that the influx in the region of buyers from the baby boomer generation looks likely to rise the temperature even higher. This latest BRIC Group article explains why. The baby boomers – those born in the two decades between 1946 and 1964 – are one of the largest generations in the US. A high percentage of them has recently reached retirement or find that the time to give up work is on the horizon and as a result, they’re looking to move. Florida with its year-round warm and sunny climate has long featured as a top retirement destination, both for US and international retirees. A significant number of them buy a home in the Sunshine State and Southwest Florida property ranks as one of the favourites. The latest Home Data Index Market Report, compiled by Clear Capital and released in early June, clearly shows the extent to which Florida dominates the property preferences among the baby boomer generation. 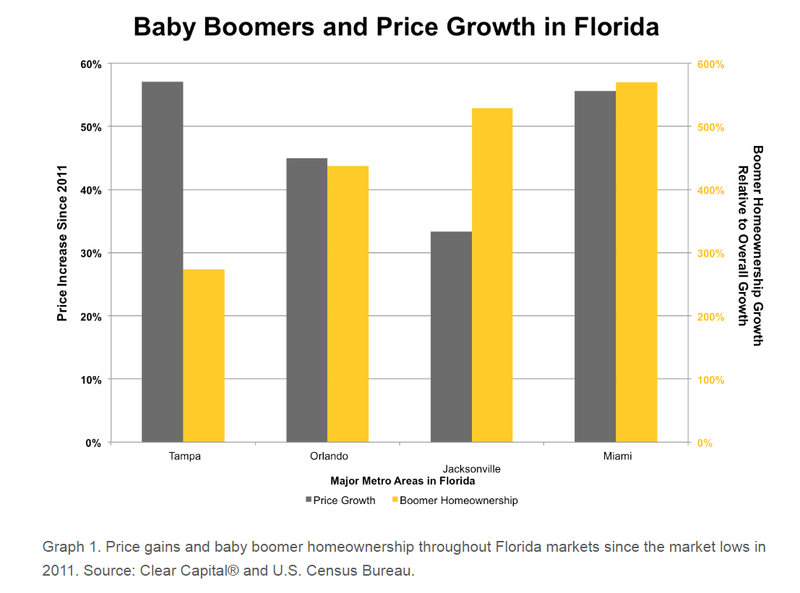 It specifically examines the relationship between the increase in the number of baby boomer residents and in property prices in four key areas for Florida property – Tampa, Orlando, Miami and Jacksonville. In the Tampa metro area, the growth in baby boomer residents since 2011 is around 27 per cent, the lowest figure of the four. The baby boomer population in Orlando has experienced an increase of around 44 per cent while this figure soars to 52 per cent in Jacksonville and 57 per cent in Miami. The Clear Capital report sees correlation between the hike in the number of baby boomers and the increase in property prices in the four metro areas. Since 2011, property in Tampa and Miami has seen increases of 56 per cent and 57 per cent respectively. Orlando property has gone up by 44 per cent and properties in Jacksonville by 33 per cent. The Home Data Index Market Report describes these hikes as “incredible gains” and says that the prices for Tampa and Miami property have “skyrocketed” since 2011. This upward trend shows no sign of abating either. Clear Capital also takes a close look at the recent performance of property in US metro areas, specifically for the quarter up to June. Florida takes 4 of the top 15 places with Sunshine State metro areas accounting for half of the first 6 places. At the top of the list of highest performing metro markets sit Seattle and Tampa, who both registered a property price increase of 2 per cent over the quarter. In year-on-year terms, Tampa property came in slightly below Seattle with a 12.2 per cent gain, the second highest in the whole of the US. Just below Tampa lies Orlando, the fourth best performing metro area and a long-time favourite spot for Florida property buyers. This popular holiday and retirement destination saw property prices go up by 1.7 per cent over the quarter and by 10.4 per cent for the year. Miami completes the top six best performers in the country with a 1.4 per cent rise for the last three months and a 10 per cent increase over the year. Just outside the top 10 is Jacksonville while property prices have gone up 1.6 per cent in the quarter and 9.5 per cent in the year. Commenting on the relationship between the increase in baby boomer residents and Florida property price hikes, Clear Capital’s vice president of research and analytics Alex Villacorta said, “Florida has traditionally been regarded as prime real estate by retirees and the baby boomer share of homeowners is clearly on the rise here”. He predicted “a boost in performance” for Florida property as more members of this giant generation approach retirement age. “The Florida property market has two clear target population groups,” said Dies Poppeliers, Managing Director of the BRIC Group, “the baby boomer generation and the millennials.” He pointed out that while baby boomers favour the Sunshine State for its climate, millennials are flocking to Florida for the job opportunities. “These tendencies lead us at BRIC Group to believe that the property market in the state will perform well for the short and medium term,” he said.